The Asus ROG Ryuo 240 is actually an exceptional AIO water cooling system. Asus has achieved an absolute unique selling point with the OLED display, with which a new level of individualization can be achieved. The cooler with its aluminum housing and the embedded display is very noble and worth the very high price. The cooling performance reaches values slightly above those of other 240mm AIO watercoolers, but this comes at the price of rather loud fans. What we also like is the simple assembly and the very good controllable pump. Unfortunately, apart from the cooler, the Ryuo 240 only provides average in many respects. So we would have liked fans with decoupling elements and covered cables. Also, a small tube of thermal grease, if you want to rebuild the AIO water cooling, is missing. It’s a pity, too, that the Ryuo 240 is primarily designed for Asus motherboards. Surely understandable on the one hand and we have successfully tested the Ryuo 240 in the review on an ASRock motherboard, but at least an Y-cable for the fans would not have hurt well to serve Asus AIO fans who do not run Asus motherboard. Maybe the addressable RGB lighting ring will get even more effects with future software updates? For the interesting design possibilities thanks to the innovative OLED display on the pump housing, the Asus ROG Ryuo 240 receives the OCinside.de Innovation Award 01/2019. 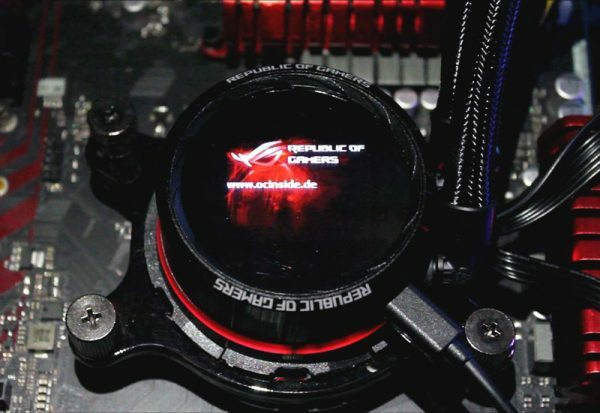 Tip: In the interactive Fit for Fan guide you can virtually fit coolers onto different motherboards and listen to many – the Asus ROG Ryuo 240 will be included in the next update.